A crash which killed a pilot carrying eight parachutists was caused by his plane's wing flaps not being correctly set for take-off, a report has said. Steven Davis, 36, died in hospital from severe head injuries he sustained in the accident at Headcorn Aerodrome, Kent, on 11 March. 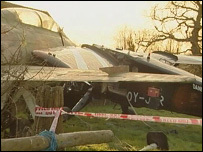 The Air Accidents Investigation Branch said Mr Davis aborted his take-off too late and hit a static display aircraft. One of the parachutists suffered chest injuries in the crash. The AAIB report said Mr Davis was on his 11th flight of the day in a De Havilland Turbo Beaver. It recorded that the parachute "jump-master" had noticed the aircraft was still on the ground as it passed a point on the runway where it would normally have become airborne. "Almost simultaneously, he heard the pilot shout, 'Abort'," the report said. "One of the parachutists shouted to the other occupants, 'Brace, brace, everyone on the floor'." Mr Davis tried to avoid a collision, but the plane hit an F100 fighter aircraft which was parked off the southern edge of the runway as a museum exhibit. The AAIB concluded that "the flaps were not set correctly [and] the aircraft did not become airborne as expected". 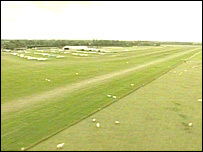 When the decision to abort the take-off was made "there was insufficient distance, by a significant margin, to permit the aircraft to be brought to rest before over-running the airfield boundary or colliding with the static museum aircraft", it said. The report also noted the F100 fighter had "faded green and brown camouflage paintwork" which made it very difficult to pick out until at close range.